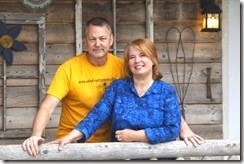 We are David and Sheri Burns from Long Lane Honey Bee Farms and Honeybeesonline.com. Even though the National Weather Service claims that March will come in like a lion with very cold temps, spring is only 23 days away. Spring means SWARMS!! Healthy colonies will swarm. If your hive makes it through winter they will likely swarm as soon as they can raise queens. Most colonies are already raising drones in preparation of mating with virgin queens from hives swarming. Are you ready? How do you get ready? Why do healthy colonies swarm? Spring swarming is the natural way colonies reproduce. Your healthy colony must create another colony in order to keep the bee population strong. It's a good thing for bees to reproduce through swarming, but no so good for you. When your hive swarms nearly 60% of your bees leave with the queen leaving behind queen cells. This means that your hive doesn't have a queen and they are down in population by 60%. If you came out of winter with only 20,000 bees, now you only have 10,000 bees and no queen. You are in worse shape than when you started with a package. At least your package had a mated queen. To add to the risk factor, your multiple virgin queens must fight it out. Sometimes all virgin queens die in the fight leaving you with no hope for a queen because the brood is too old to raise a queen after 3 days. When the virgin queen takes her mating flight she faces the dangers of being eaten by a bird, not making it back to the right hive etc. And if you were hoping for a honey crop but your hive swarmed, your honey crop will be greatly reduced if not zero. Consider Taking My Spring Management, Swarming & Making Splits ONLINE COURSE...click here. Take it from the comfort of your home. We are also offering a Spring Management course here at our training center on Saturday March 30th from 1pm-5pm. This class has 4 spots still open. REGISTER NOW. You really cannot tell if your hive swarmed or not judging by the number of bees left behind. They can swarm when you are not home to see it. You don't even know they swarm until you realize your hive isn't performing well. This is why preventing a swarm is so important. Swarm prevention is challenging work and takes skill and a thorough understand of the anatomy of the colony. For example, even if you make room by adding a super, a reproductive swarm will likely still occur. A reproductive swarm is entirely different from a swarm caused from overcrowding. Even though hives begin giving off early warning signs of a swarm 30 days prior to swarming, sadly, beekeepers are uninformed on what to look for and how to take the necessary action to prevent swarming. Most beekeepers are convinced swarming will not happen to them and so they are not prepared. 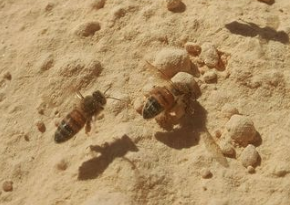 When your colony swarms, they will land on your property not far from your hive and hang on a tree for several hours or several days before they finally fly off to their new home several miles away. 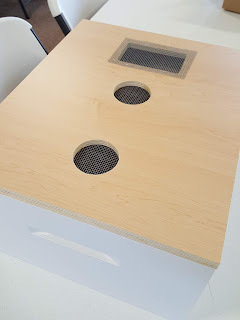 Unfortunately, most beekeepers do not have a spare hive to catch and place the new swarm into and within a few hours the swarm flies away and is gone forever. Make sure you have a new, fresh hive ready to place these "free bees" into as their new home. 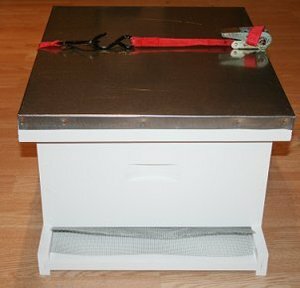 We sell an Emergency Swarm Hive Kit. This kit comes with a tie down strap that wraps around the bottom board, deep box and top cover. It also comes with a screen mesh entrance screen to keep the swarm in so you can transport it to their new location. This is handy to have on hand and even keep in your car or truck should you spot a swarm while traveling or should you get a call to retrieve a swarm. Be ready! 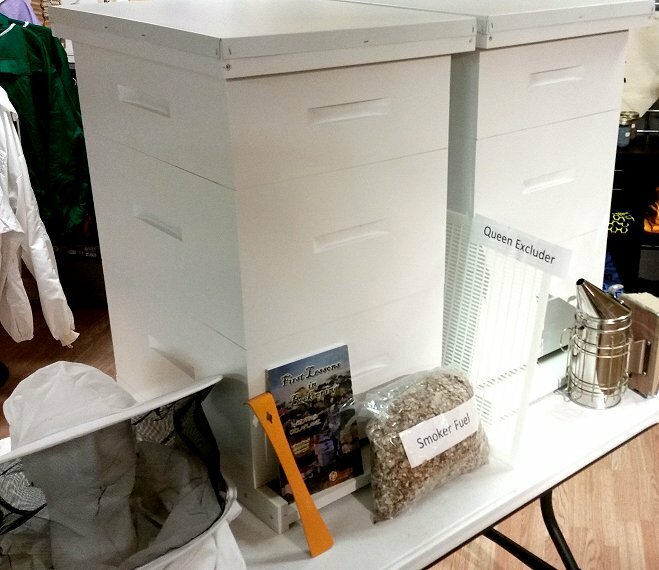 If a neighbor calls, or the local school knows you keep bees and they ask you to come catch a swarm, be prepared with this swarm kit. You can even make extra money removing swarms from homes. Drop your name and phone number to local police departments, home improvement stores and pest control companies. You will be helping out your community. Beekeeper. I've taught beekeeping classes for over a decade. You've seen me on YouTube, now join me for the afternoon on March 9th from 1pm-6pm. This is my last Beginner's class I'm teaching onsite for the year...LAST CHANCE. You can save shipping by picking up your beekeeping supplies at the same time. CLICK HERE NOW! I'll make room for you. Here's a nifty little way to help your bees. Buy our pollen substitute powder and place it in a bowl or on a board in your bee yard in late winter and early spring. Add a tiny bit of honey to attract the bees faster. Then, watch them pack the powder in their legs and head back to the hives. It's so easy and fun to watch. Make sure you do this on dry days. Don't Wait Until You're Desperate Or It's Too Late! Make Sure You Have A Hive To Put A Swarm In. It's better to start with two hives. If you have bees, they are likely to swarm. If you catch them and place them into a new hive you've just saved $130! Have a hive ready to put them in. Our hives are Amish made here in Illinois. Top Quality. Order now. You Will Need Some Coaching This Spring? Spring brings panic into the hearts of beekeepers. Knowing what to do and when is the tricky part of beekeeping every spring. -When Can I Start Feeding? -Do I reverse the deep hive bodies? -Should I let them raise a new queen or buy a new one? -What is checkerboarding and how do I do it? -How do I avoid spring farm sprays and will it kill my bees? -Why does the new study on mites going to bee's fat bodies matter? -Does my honey have to be 18% in moisture content? -What does the deadly American foulbrood look like? -Why is chalkbrood and European foulbrood worse in the spring? And how can I prevent it? Let me be your mentor. I have a special mentorship program called BeeTeam6 where you can call, email or text me concerns or questions you are having about your bees. Plus you receive a regular tip and an instructional beekeeping video. Even if you are not keeping bees yet, this is perfect to help you gain the education you need before you start. Or if you are starting this year, why not have the extra peace of mind by having someone you can consult.